Classroom management when students are working with computers can be challenging. 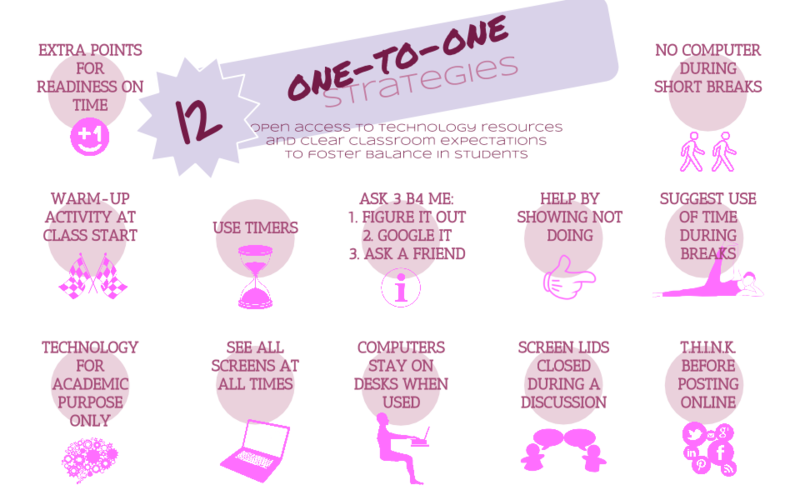 Here are some proven strategies that can help you keep students on task behind their screens. Keeping an open policy at school regarding technology is an effective course of action to help students become more self-regulated learners. But it is not sufficient. You also need to create a framework for the students in your classroom to understand the parameters in which you expect them to learn using technology. Besides creating engaging digital assignments that challenge students and maintain their attention (“search it on Google” is not a valid assignment), establishing a set of class rules with your students will foster the necessary balance. And most importantly: enforce those rules. It is a privilege to use a computer at school, not a right. If a student does not want to use technology in an academic way in your class, then he shouldn’t used it at all. Decide the status of computers (on or off) when students enter the room and when class starts. Reward students who are ready on time. Always have a warm-up activity for students at the beginning of class. Always position yourself to see all the students screens (place students on the inside of a horseshoe, or if all are facing forward, stand in the back). Request that students keep computers on their desks. Keep all laptop screen lids closed during a discussion. Insist on use of technology for academic purpose only. Follow the “T.H.I.N.K. before posting online” rule (Is it True, Helpful, Inspiring, Necessary, Kind?). Post signs around your room with steps and rules to follow including what to do when stuck or finished. Ask 3 before me: 1. try to figure it out, 2. look it up online, 3. ask a neighbor. Remind students that they can only help someone by talking not by doing it for their friend. Point to and explain. Suggest to students how to use their time during the breaks between classes. Remember that technology is the perfect avenue to differentiate instruction! We’ll look at differentiated assignments in another issue.